Welcome to our Ph.D. 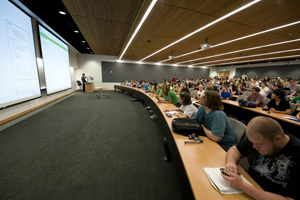 Program at the G. Brint Ryan College of Business, University of North Texas. The University of North Texas (UNT) is the premier university in the North Texas region. It is the largest comprehensive university in the region, and the fourth largest university in Texas. The G. Brint Ryan College of Business is one of the leading schools in UNT. We offer Ph.D. Programs with concentrations in eight fields. Our Ph.D. Program is primarily designed to prepare future teachers and knowledge creators in the area of business. Typically, our students start their careers as faculty at the university levels. We invite you to explore this web page and links for details about our Ph.D. Program and its concentrations. If you need more information, please do contact our program office at (940) 369-8491 or phdcoba@unt.edu. For a complete list of THECB Marketable skills, visit https://vpaa.unt.edu/thecb/cob/busi.